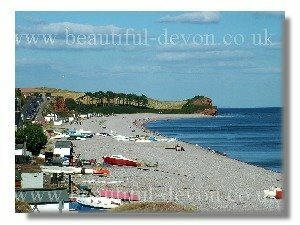 Budleigh- on the mouth of the River Otter itself a Wildlife haven . Notice the cobbles the size of a woman's hand on the beach. Did you know they came from ancient rivers? Walk north west along the coast path towards Ladram Bay, or in the other direction to Sandy Bay, itself a sheltered beach around Orcombe Point to Exmouth. Ladram Bay, dominated by the red sandstone sea stacks just offshore, backed by cliffs, very sheltered and a sun trap. Car parking is very limited, though the beach is well used due to the proximity of a large holiday park. Otter Estuary Nature Reserve. Otterton, East Devon. Though one of the smallest estuaries in Devon, one of the most pleasant to explore. For nature lovers especially a delightful Devon walk. Looking at tranquil scene today it is hard to imagine that 500 hundred years ago cargo ships, before the estuary became silted up, travelled as far upstream as Otterton. Now three quarters of the estuary is salt marsh- a haven for wildlife. Colonised by plants such as sea purslane and searush, wafting in the summer breeze. Alive with the sound of reed warblers in spring, heard but rarely seen. You may be lucky and see mullet cruising the channel on an incoming summer's tide. A delightful and peaceful place. Otterton itself a delightful village, thatched cottages lining the main street. The Mill, hundreds of years old, still producing flour, but with a craft gallery and delightful restaurant by the River.